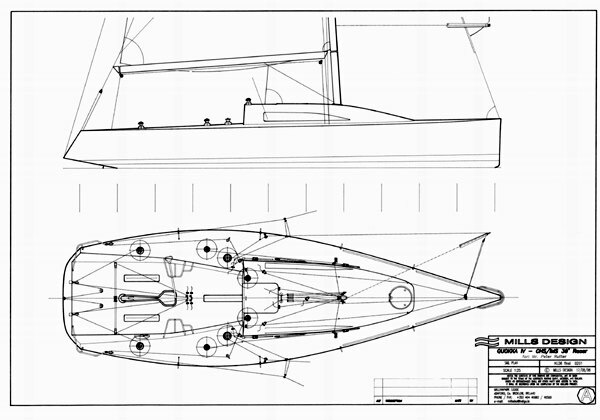 Beautifully built 36′ CHS/IMS design was top UK boat ’98&’99, brought up to date in 2007. Launched in late 1997 our 36′ design Quokka fulfilled our highest expectations. 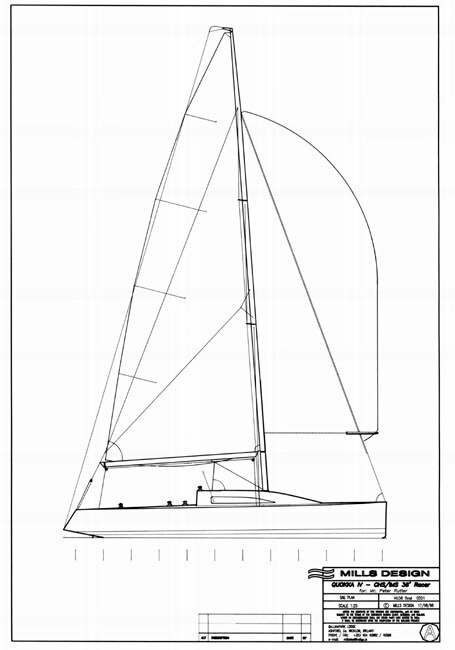 Mills Design was pleased to have been selected by Peter Rutter, RORC Committee Member and prominent Solent yachtsman for the design of his fourth racing yacht, intended for use under both CHS and IMS. 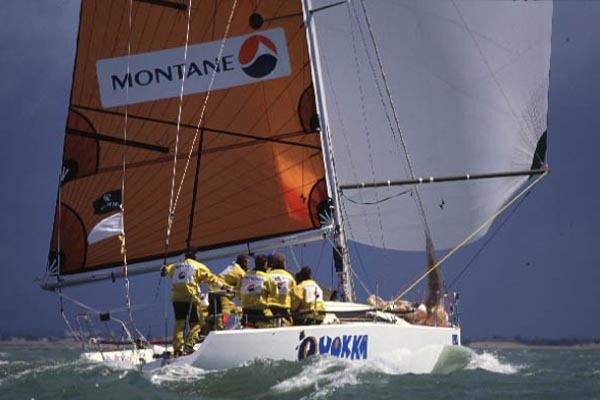 In her first series she triumphed in the 1998 Warsash Spring Series in the competitive Solent, home of the best CHS racing in the world, without needing either of her two discards. 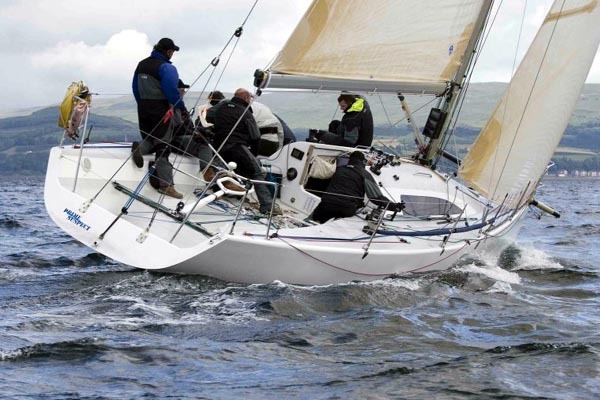 Beating off a new Sydney 46, a Bashford 36 or two, and the new Prima 38 One Design among others, she showed exceptional speed and control throughout the seven weekends of the event. Her next task was to gain selection for the England Commdores Cup Team under IMS, which she did after a heated battle in Class 2 by winning the entire trials series. As well as this she won RORC Class 1 and the Assuage Trophy. At the core of this design is a modern hull geared to perform best in 8-16 knots of breeze. The basic hullform is a synthesis of CHS and IMS design, with its moderate beam and rounded sections, with the sensitive IMS parameters present in the correct ratios for IMS optimisation. This results in a clean hull which when combined with high stability and a large sailplan provides exciting performance in all conditions. The fine waterlines forwards offer improved speed upwind, especially in a chop, while the balanced sections aft provide both stability upwind, and controllable speed offwind. The hull and deck have been constructed of foam with e-glass and epoxy resin skins, cured under pressure from a vacuum bag. The refined engineering was provided by John Fox of FCS in the US, ensuring the durability and light weight of the design. Indeed her exceptional build and engineering qualities made her the focus of a lead article in the trade magazine “Professional Boatbuilder” on core materials and applications. 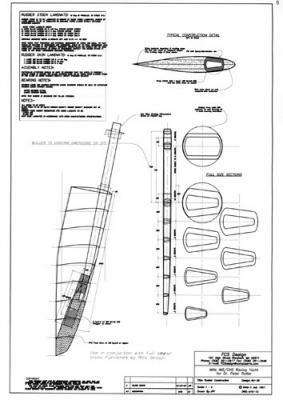 The keel and all-composite rudder both use the modified laminar flow sections popular at Grand Prix level, the keel employing a large low drag keel bulb offering maximum stability at the lowest cost in terms of drag and displacement. The foils are designed to offer excellent feel and balance, and possess enough area that they are not super-critical to steer to. The original rig was a Hood Spars two spreader fractional arrangement with 63.2 sq. m. of sail area optimised for CHS. The 12 degree aft swept spreaders reduce the reliance on running backstays, providing an extra margin of security during tricky maneuvers as well as a rating gain, as well as greater ease of shifting gears in changing conditions. The checkstays could be removed for non-IMS sailing to avoid the penalty they incur under CHS. 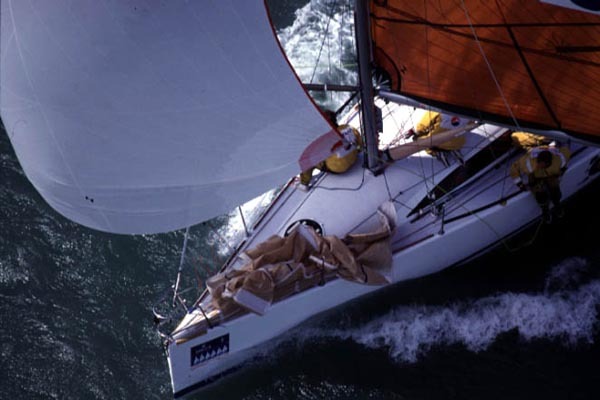 With CHS rules governing spinnakers changed in 1996 to allow asymmetrics without penalty, they play a significant role in the downwind inventory. The mainsail is so large (only 3.7 sq. m. less than a Bashford 41 main) that we felt a pair of mainsheet winches would ease the pressure on the mainsheet hand, although for more aggressive campaigning a coarse and fine tune system could be implemented.With the IMS Dynamic Allowance of approximately .25% replacing the Cruiser/Racer allowance of 1.5% the necessity for a Cruiser/Racer deck and interior has abated. The race optimised deck layout reflects current racing practice with attention paid to optimising crew manouvers, a minimum amount of hardware, and control lines grouped for easy access. This deck layout brings an Admirals Cup level of utility and finish to Racer/Cruisers ensuring that the crew can work at optimum efficiency, in contrast to the limited IMS Cruiser/Racer cockpits with coamings and seats.The interior reflects the designs dual purpose focus but includes ten berths, a galley, nav station, and enclosed head forwards, all finished in matte white epoxy and trimmed with teak. The quality of finish inside exceeds anything we have seen before in a Racer/Cruiser, integrating input from 2HO and their legendary attention to detail. In 2007 the rig was replaced with a new 20 deg. swept spreader non-overlapping rig, with masthead spinnakers, leading to a significant jump in performance and returning her as ‘Prime Suspect’ back to front line competition.